Everyone talks about contextual advertising and how it wreaks havoc online by introducing bizarre ad/editorial juxtapositions. Of course, it’s not a new problem. 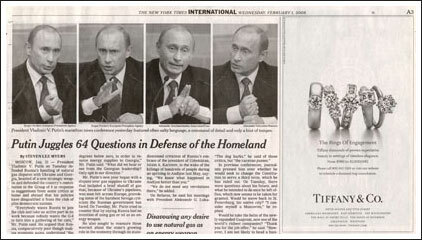 Graphic design site Speak Up has posted an interesting piece about the relationship between the stories in The New York Times and the ads—specifically, the Tiffany’s ads that always run on page 3. In 1991, the artist Laura Fields, in an art piece called “Child’s Play,” pointed out one problematic page 3 in particular, which had a Tiffany’s ad for a silver baby rattle next to a story about a tortured child. Inspired by the piece, the Speak Up writer began looking at page 3 differently, “always looking for a correspondence between the narratives of news photo and Tiffany ad, a correspondence between text and image, or simply a correspondence of shapes.” To illustrate that correspondence, the author has posted 30 New York Times page 3’s, and the connections between ad and editorial are often uncanny. Definitely worth a visit. Via Design Observer.